I took these pictures during and after my first ride in an electric taxi. You could talk easily to the driver, which helped as we had to change route due to a road closure. It’s got USB charging points for phones. But the best feature must be the glass roof. Although the rain ruined the view. It wouldn’t be a London taxi without a few strong negative opinions from the driver. He’d just cleaned the taxi and the rain was ruining his work. There are not enough charging points. He didn’t think Uber pay enough tax. Doesn’t everybody think that? The driver certainly seemed pleased with his cab. As a perhaps five-times-a-month user of black cabs, I will certainly look forward to having another ride, as they are definitely a better experience. You can’t write about black cabs without adding a comment about other minicabs, private hire vehicles and Ubers in London. When will new additions to these fleets of other vehicles, have to be electric? It details what happened in Austin, where after a spat over security, Uber left the city. It gives a good insight into Uber and how the people of Austin reacted. I’ve only ever used Uber once and the guy got lost three times between Walthamstow and Dalston. For the pick-up he had come all the way from Ealing, so how environmentally-friendly is that? I generally only use black taxis from a rank, as otherwise I use the buses or trains, as I have a Freedom Pass. What I object to about Uber is a variety of things. How can I be sure that the driver is fully insured and pays their taxes? All private hire cars and taxis should be recognisable. So Uber cars must have an Uber sign on the side! I like to pay taxis in cash! Uber’s database will get hacked soon and I don’t want to lose my details. But the biggest thing about Uber and the other private hire vehicles is the congestion and pollution, the number of vehicles in London creates. All new black taxis will have to be zero-emission after the first of January 2018 and vehicles over 15 years old will have to be retired. Do the same rules apply to Uber and the other private hire vehicles? If not, it’s not a level playing field! I said it was a storm in a teacup about Uber. TfL, Uber and the other private hire vehicle companies will agree a set of rules, which is fair to all. And that must cover the important ones of driver suitability, congestion and pollution. But within twenty years all taxis will be driverless electric vehicles. As one black-cab driver put it to me, if he could buy one of those, he wouldn’t need to suffer the stresses of driving in London and he could retire. The City pf London is proposing to make Bank Junction accessible to only buses and cyclists. On a personal note, I’m in favour, as my normal route to and from the area of Bank station is to take a 21 or 141 bus. I also use the 141 bus to get to and from London Bridge station, as the terminal stop is on the staion forecourt. They are extremely convenient buses for me as the Northbound stop is perhaps fifty metres from my house over a zebra crossing. Going South, the walk is a little further, but it is no more than a hundred and fifty metres. However, not everyone is in favour of restricting traffic at Bank Junction. This article in the Standard is entitled Cycling campaign groups slam black cab protest over traffic ban at Bank station. Cycling campaign groups have slammed a taxi protest over plans to close Bank junction off to most traffic, saying drivers are supporting “the right to poison Londoners”. Black Cab drivers brought traffic to a standstill on Monday evening as they protested plans to close off the notorious junction to all traffic apart from bikes and buses. Union members have argued that the proposals to only allow cyclists and buses at the junction are an example of TfL dodging the problem of congestion. So it would be cyclists on one side and black cabs on the other. The RMT union blames Uber on their web site. The union claims the congestion is caused by Uber cars which, in turn, leave people turning to cycling out of “desperation”. As I said earlier, all I want is this vital junction to run smoothly for buses. I don’t use a taxi very often, except on say a busy, wet day to bring my shopping home, as the rank is outside Marks and Spencer, Waitrose and Sainsburys. How convenient is that? The taxi drivers are not happy, but then London’s black cab drivers have rarely been happy in the years I’ve used them, since the 1960s. Getting to my house has caused a new moan, which is caused by the work that I wrote about in Why I’m In Favour Of Cycling Superhighways. Cyclists are always good for a moan. But their biggest ire is usually reserved for Uber and their lack of regulation. Surprisingly, I’ve had no moans about moving to low-emission or electric vehicles. So how do I think the situation will improve in the next few years? Crossrail doesn’t serve Bank Junction directly, but I will be surprised if the massive double-ended Crossrail station at Liverpool Street and Moorgate, doesn’t attract a lot of passengers travelling to and from the City of London. Under Future Developments, Wikipedia says this. A new entrance on Walbrook, near Cannon Street station, will provide new escalators and lifts to the Waterloo and City line platforms. TfL is also consulting on retunnelling and widening the Northern line platforms. Adding lifts and new entrances on King William Street and Cannon Street. A new tunnel could be built to relocate the southbound Northern line platform. The work could be completed by 2021 and will boost capacity by 40%, with 12 new escalators and 3 new lifts. A well-designed Bank Underground station must relieve surface traffic of all types in the area. When the new entry at Wallbrook to the Waterloo and City Line, opens hopefully in late 2017, it will dramatically improve the usefulness of the Waterloo and City Line. But improvements are also needed at the Waterloo end of the line. Better connections to the new platforms 20-24 at Waterloo will be needed. Are they being provided in the current works. Better connection to Waterloo East station, so passengers can get access to Charing Cross services. The line should at least run seven days a week, if not all the time under automatic control. It could be a much more important line in London’s transport system. It could even be renamed the City and South Bank Line. The Northern City Line is London’s forgotten suburban line, as it terminates in a two-platform station under Moorgate station. One of Crossrail’s collateral improvements will be to give the Northern City Line excellent connections to the following. The deep and dingy station will also have much better connection to the various walking routes in the area. But connectivity would be nothing without trains and the Northern City Line is getting new Class 717 trains, which could run at up to twelve trains per hour all day. The original plans for the Northern City Line envisaged the line running to Lothbury station, which would be just to the North of the Bank of England. If this extension had been built, it would have surely proved to have been a valuable part of London’s railways. But it wasn’t and probably to build it now would be too expensive and impossible. 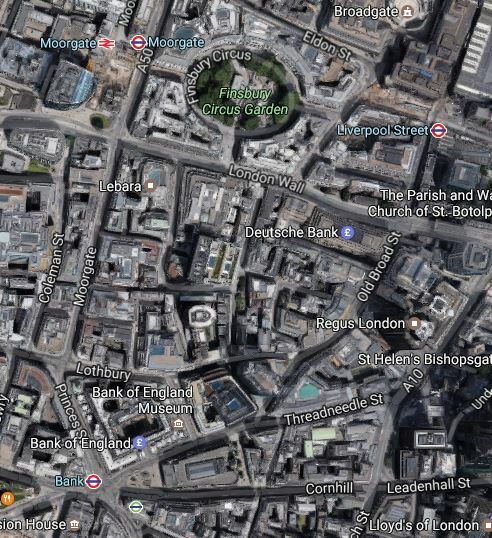 The actual City of London is compact and this Google Map shows the Northern part of the City between Bank, Moorgate and Liverpool Street stations. How one of the three main stations is within reach of much of the area. I would reckon that the three stations are about eight hundred metres apart. If you don’t fancy walking, there are bus routes between the stations and the Central and Northern Lines also provide connections. Uber is the fox in the hen coup. It is disruptive technology and I don’t like it for various reasons. I like to pick up my cab from a rank or by hailing it on the street. I feel that apps with credit card details in them will be the next big fraud opportunity. I like a properly trained and regulated driver, who understands the intricacies of London’s streets. I took an Uber cab once from Walthamstow to home and the driver came from West London and managed to get lost twice. As I wasn’t paying, I didn’t bother. I can’t help feeling that Uber is very inefficient for the driver and only works if they have a monopoly of taxis on the streets. I have given alternatives to the use of taxis around Bank Junction. Taxi drivers will protest, but that area is one, where for most people, public transport will increasingly be the best way to travel. I don’t use taxis much at all. I did in Blackburn on Saturday, as one was there, when I came out of Ewood Park and as trains to Preston, are fairly infrequent, I felt it might be quicker than finding a bus and I might catch an earlier train. I didn’t! Other than that since the first of September, I’ve used taxis perhaps twice to come back home after arriving late at night in a rail station, just to save time. I usually get them off the rank at the station. I use a mini-cab perhaps twice a year, to get to and from my son’s house on Christmas Day, which I book personally at the office around the corner from where I live. The reason for this low usage is also because I have a dozen or so bus routes within two hundred metres and four of these are all night routes. And as London buses are ideal for parcels and shopping, when coming home with bags, I rarely need a taxi. I would also put taxis in that category of wasted money, which is better spent on something more enjoyable like a proper lunch, rather than a drink and a banana. But the main reason, I don’t use Uber is that it’s an app and I don’t want to put any apps on my smart phone, which I use exclusively for the web and to send and receive text messages. I also don’t like giving my e-mail address and mobile phone number to companies or individuals willy-nilly, as so many companies like to send me unsolicited messages. I’m certain, that apps will be the next security hole, that will be targeted by fraudsters. As Uber has created lots of enemies for itself, I would put the Uber app at the top of the list of innocent trojans to get control of your phone, as fraudsters would like an app used by lots of users in insecure places. People would also be much more careful with a financial app from their bank, financial advisor or credit card. I think it is true to say, that in London, I am annoyed by traffic congestion which slows the buses and creates more air pollution. Uber is helping to make this worse, as there are more and more mini-cabs in London. Last week, I was on a bus that took an hour to get from Upper Street to Monument at ten in the morning, when the timetable says twenty-three minutes. So I very much back Boris, who wants to limit the number of mini-cabs. I got a taxi home today, as I had a heavy parcel to carry and was surprised to see it was fitted with a mobile phone charger. I didn’t need it, but I like the idea. It’s all described here. Apparently, Voafone, who’ve set it up, has a system, where the taxi fare can be charged to your mobile phone bill. It’s ideas like this that will be the best defence against Uber, when coupled with the black cab driver’s knowledge. The latter was illustrated recently in Edinburgh, where although it was a black cab, the driver didn’t have the knowledge that I expect from a driver. I remember once, C and I were going to a house, in a tucked away square in South London. The driver dropped us in the next street and said there was a litle passage into the square. There was and it was just by our destination by chance. You don’t get that sort of knowledge from a computer system! On Wednesday London’s taxi divers staged a protest again Uber. I was in the area, so I took a few pictures. There have been reports that Uber benefited from the protest. There has been a lot of opposition to the taxi-app called Uber around the world, with London taxi-drivers being particularly vocal. It probably won’t affect me in London, as I’m not a very heavy user of taxis. Usually, I only use them, when late in the evening, I want to get home from a station and I’m tired. I wouldn’t use Uber though, as I don’t do apps on my mobile phone. So my only worry is that Uber is so successful, black cabs become a rarity and I can’t find one when I need one. We should also remember that a lot of people are like me and need to sit down to do anything complicated on a smartphone. Which probably means I’ll avoid apps like the plague. I also avoid signing up to many companies, as they just fill my inbox with spam. I suspect that if I downloaded an app for a bookmaker, I’d constantly be pestered to have a eit. I’m in control, not the company and anybody who thinks otherwise doesn’t get my custom or business. As an example, if there is an alternative to Virgin Trains, I use it if it’s cheaper or more convenient, as Virgin keep sending me junk mail through my letterbox. I also think that black cabs should trade on their strengths, like their knowledge, their ranks and their general friendliness and jokes. They also should make it, that all black cabs take bank and credit cards. Last Saturday, I could have had an embarrassing moment, when I took a taxi back from Waterloo. I thought I didn’t have enough cash and the driver didn’t take cards. But luckily, I had another note tucked away in my wallet.